The New Mexico Department of Health announced today that childhood obesity rates among New Mexico 3rd grade students continue to decline, with a 20 percent decrease since 2010. In 2010, 22.6 percent of 3rd grade students were obese, compared to 18.1 percent in 2014. 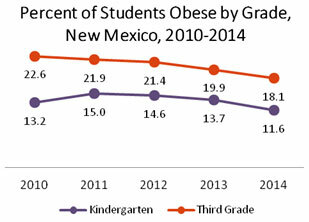 Also, for the first time since the Department began collecting Body Mass Index (BMI) data in 2010, obesity prevalence rates in New Mexico kindergarten students are lower than in 2010, going from 13.2 percent to 11.6 percent in 2014. Governor Susana Martinez and the New Mexico Department of Health are working hard to increase opportunities for physical activity and healthy eating for New Mexico children through its Healthy Kids New Mexico Program. It’s a collaborative effort that includes many partners at the local and state level, including the New Mexico Public Education Department, Children, Youth and Families Department (CYFD), the Human Services Department and the Department of Transportation. Healthy Kids New Mexico and over 300 state and local partners have collectively leveraged at least $3,911,322 since October 2011. Healthy eating and active living are the two major lifestyle choices that can prevent obesity and subsequent chronic disease. “By transforming the environment and expanding opportunities for healthy eating and physical activity, Healthy Kids New Mexico and its state and local partners are improving the health of New Mexico’s children as well as the health of the families and communities in which they live, learn, and play,” added Secretary Ward. Over the last 3 years, Healthy Kids New Mexico, in partnership with CYFD, has been working with New Mexico’s licensed childcare centers to increase healthy eating and physical activity opportunities for pre-school children. Roughly 42,000 preschool children attend licensed centers. Eighty-three percent (31,590) of students in participating elementary schools have increased healthy eating opportunities, such as pre-made salads, tasting classes, and fruit and vegetable school snacks three times a week. Sixty-four percent (24,278) of students in participating elementary schools have increased physical activity opportunities before, during, and after school on an ongoing and regular basis, such as walk and bike to school, mileage clubs and fitbreaks in the classroom. The Robert Wood Johnson Foundation is highlighting New Mexico’s success at reducing childhood obesity in its Signs of Progress Report. The report uses the Department of Health’s 2010 - 2013 childhood obesity data. For more healthy eating tips and information, vitis the Healthy Kids New Mexico section of our website.